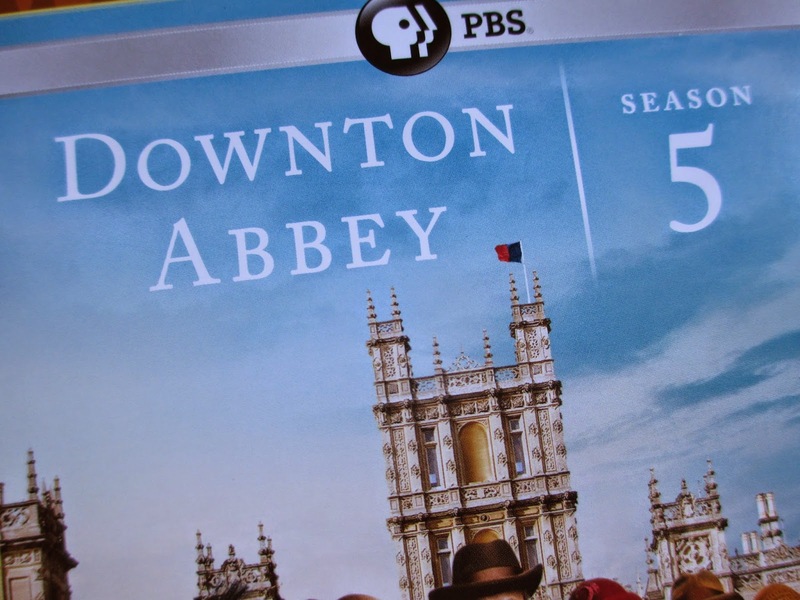 1) Downton Abbey - I used to say I didn't like Downton Abbey that much, but since then I've watched it again and again with other people and now I've come to have a certain fondness for it. It's become like a cult series: I can walk around saying things like, "I wish Anna were here to clean the house, " or, "Daisy, make us some tea." Once you get to know all the characters, it's fun to guess what they'll do next or laugh at their eccentricities. I've just finished Season 5--a post with some thoughts will be coming soon. 2) Sur la Table Apron - It was about time I got an apron. I realized I needed one at Thanksgiving, so I took the chance when Sur La Table had their aprons at half off. Speaking of, the color and pattern of this one make me feel like Daisy when I wear it. What's nice is that it's pretty while still being neutral, without frilly patterns or bright colors. 3) Libri Mutti Beauty and the Beast Journal - While this journal's cover is like paper instead of some sturdier material, it's absolutely gorgeous, anyway. Pale pink, faded gold page edges, and that story for the cover. Lovely, lovely. 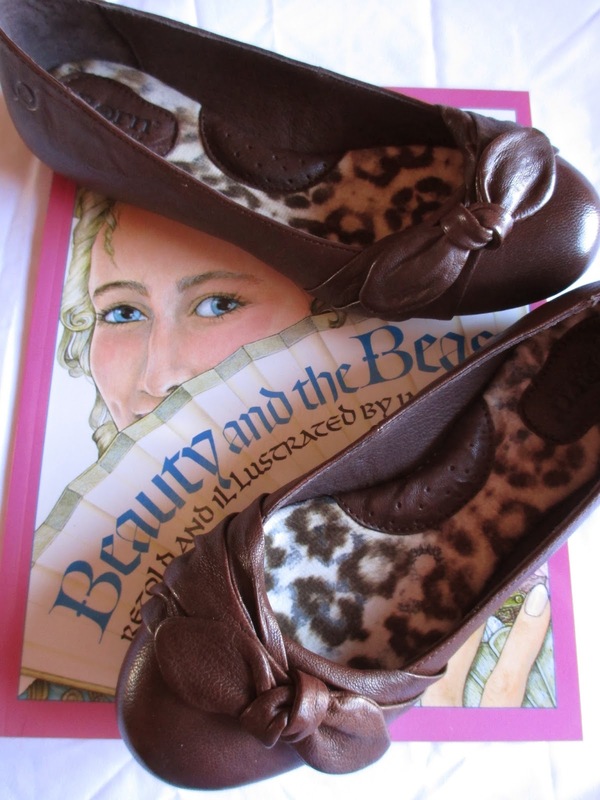 4) Born Brown Leather Flats - Well, actually I haven't really even worn these anywhere yet. It's been cooler weather, so I've still been wearing boots or other closed shoes. But I was needing a new pair of flats. I'm hoping they'll be sturdy and comfortable (though it's hard to tell with flats before you've walked around a lot in them), and the brown color is the right neutral for my wardrobe. 5) Green Monogrammed Notebook - Yes, yes, I had a bit of Christmas money to spend at Anthropologie, so I also got this notebook there. I don't usually like monograms, but letters seem to make more sense on a book, and it was green with the letter for my last name, so I couldn't help but to get it. 6) Vintage White Hat - Ah, antique stores. I was helping someone look for a furniture piece and happened on this nine dollar hat, so why not? It's been perching on my bookcase, making me want to wear it out to a spring tea party--if only it were spring and I had a tea party to go to. 7) Les Marquis de Laduree Chocolate Book - In addition to the two notebooks, I found this chocolate book on the sale shelves. 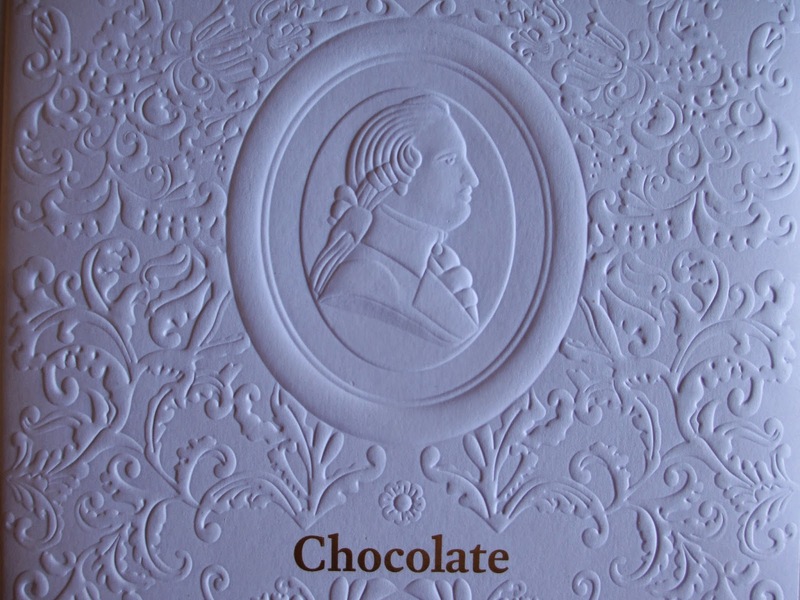 Although I'm not really familiar with the company and so far don't feel overly awed by the recipes included in the book, there are some informative sections on chocolate and some very nice pictures. Even just as a book to flip through (or look at its pretty white cover), it was a nice find. 8) Fossil Wallet - I hate women's wallets. Really, I do. Most of them take up far too much space, and many of them don't even hold that much for all the space that they take up. (There are some small ones, but those hold absolutely nothing.) And too many are in crazy colors that I don't care for. So I bought a men's secretary wallet. It's brown leather (my favorite neutral), it's thin, and it fits lots of cards and things. Why didn't I do this sooner? 9) Star Wars Costumes: The Original Trilogy - I had the costume book for the prequel trilogy already. When this one came out, it was time to complete the set. I may not read a huge amount of non-fiction, but I do love movie books. 10) Level 99 Cuffed Cargo Shorts in Dark Grey (Anthropologie) - I hate trying on shorts and pants and from all the exciting clothing items, paying $80 for a pair of shorts is far from exciting. But I have one pair of denim Level 99 shorts that I love, and this time I got these dark grey linen shorts. They fit right and look nice and summer will be here in the blink of an eye, and despite the price tag, I know I'll be happy with them. I've been wondering for the last few years why there hasn't been a good version of Beauty and the Beast coming out. There is so much about this story that has so much relevance toward everything that we've been enjoying in movies and fiction lately, so I don't know why the story hasn't been more in the front lines. Until now, that is. Now we learn that Emma Watson will be playing Belle in Disney's new live action version. I'm guessing it will be (like Cinderella seems to be) very close to the animated version. I'll be eager to see how it turns out. But all this brings me back to why Beauty and the Beast is such a modern story. Maybe it's because Disney did such a good job of reimagining it back in 1991. If you've read anything of Gabrielle-Suzanne Barbot de Villeneuve's 1740 version (click here to read a few thoughts I had on it) of the story, it reads very much like a mid-eighteenth century novel in the concepts of politics, marriage, and women. But Disney's movie pulled out a fairy tale skeleton and painted it over with modern interests: adventure, imagination, individuality, and a fresh start. Belle's father is an inventor instead of a merchant: that removes all the political implications that came with him being a merchant at that particular point in history and simply makes him a unique man trying to follow his dream despite the entire town making fun of his efforts. Belle isn't a quiet girl who obeys her father's wishes and tries to make due with her family's loss of money; she's an intelligent young woman who wants to have a place in life to live out all her potential, complete with all the adventure of a life lived fully. Then we come to the Beast. Belle doesn't have dreams of a prince who needs her help, and the Beast doesn't ask her every day to marry him. So the themes are less about marriage and social status and more about looking past the exterior and about finding redemption. In Belle, the Beast finds the chance to start a new life--but he can only start that new life if she can ignore his (literally) cursed facade. This theme of wanting to begin again is very relevant, as is Belle's sacrifice, her choice to stay at the castle to save her father (Bella, Harry Potter, and Katniss and every other character that's been popular lately all make sacrifices to save the people they care about). And then there is the more obvious inclusion of fantasy. Unlike other fairy tales, Beauty and the Beast takes place in a real world with fantastic elements. It's France in the not too distant past, just with an enchantress and a spell. Just one enchantress and one spell mean that there is enough of reality to let the fantasy be all the more powerful and believable. And need I even mention that the Beast is very like a werewolf? While Belle is a character we can associate ourselves with and look up to, it's the Beast that carries the plot in Disney's version; it's the Beast who, like us, wants the chance to be accepted and forgiven, to have the past set aside in favor of a brighter future. A little over a year ago, I tried Numi's Chocolate Pu-erh tea, which I felt rather favorable toward. I still have some occasionally, in fact. (You can read that review here.) While I liked that tea and found its use of chocolate rather more authentic than in many other chocolate teas, I did also admit that the use of pu-erh tea would probably alienate a certain percentage of people. I guess Numi thought the same: they now have a range called Indulgent Tea of more traditional teas combined with chocolate. The thing is, the chocolate element is the same. It's cocoa powder, despite the picture of a spoonful of nibs on the box. So it has that exact same earthy, rich, almost bitter flavor as the pu-erh tea had. If you want more of a sweet chocolate tea, this may not be the one for you--unless you add in milk and sugar, I suppose. Though I'm anxious to try the chai tea version, I went for the Earl Grey first: I've had chocolate chai before but never chocolate Earl Grey. Honestly, though, Earl Grey isn't always my favorite tea, even though it's one of the most popular kinds--I prefer darjeeling. I tend to like citrus notes in perfume (though I can never distinguish them as such), but not always as a flavor. And I don't tend to like citrus chocolates much. With that said, I quickly finished off the twelve tea bags in this box. Besides the cocoa powder and black tea, the other elements are orange peel, vanilla beans, and bergamot oil. If this particular, earthy chocolate flavor is new to you, it's possible for the citrus to fade behind the chocolate, especially if you add milk. It also turns bitter if you overbrew, though a long brewing (I find) works well for the chocolate side. So you kind of have to experiment to see what brew time you like best. While I'm not completely convinced that the chocolate and bergamot were buddies, I suppose the citrus notes do add a little pop of color and fruitiness that can brighten up what is a fairly deep sort of tea. I only add (almond) milk to a few teas, but I did find that this was one of the kind I prefer with just a splash to help coax out the creamier flavors. It's that hot chocolate effect that's irresistible to try and lightly imitate. I completely forgot to try it with sweetener, but that's just as well: I never sweeten tea. While I probably wouldn't specifically buy the Chocolate Earl Grey again, I definitely want to try more of the Indulgent Tea range. 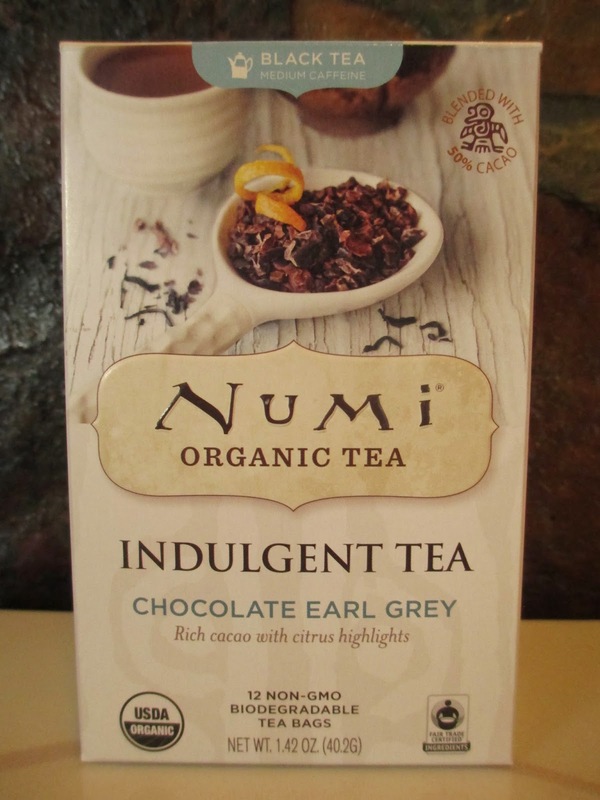 Numi is a generally good brand (all of the ingredients in here are organic and the tea and cocoa powder are also fair trade), and they've found a way to handle chocolate tea that does not give either an artificial or cloyingly sweet flavor. And that is something to recognize. Dinosaurs in the snow; that's what Connor and Abby had to deal with this time. A Spinosaurus was out on the loose, leaving its large footprints in the freshly fallen snow. Keeping a careful distance, the team approached the out of place animal. Abby took the lead and soon the Spinosaurus was under control and contained and sent back to the Cretaceous. Connor thought this might be a nice time for making snow angels . . . and so Abby decided that she might as well follow suit. After all, they'd done their work; now it was time to enjoy the snow for themselves. Technically this box was in the Christmas section, so technically I am rather late in coming to it. But I decided that lateness would be alright since chocolate twigs don't feel very necessarily Christmasy. 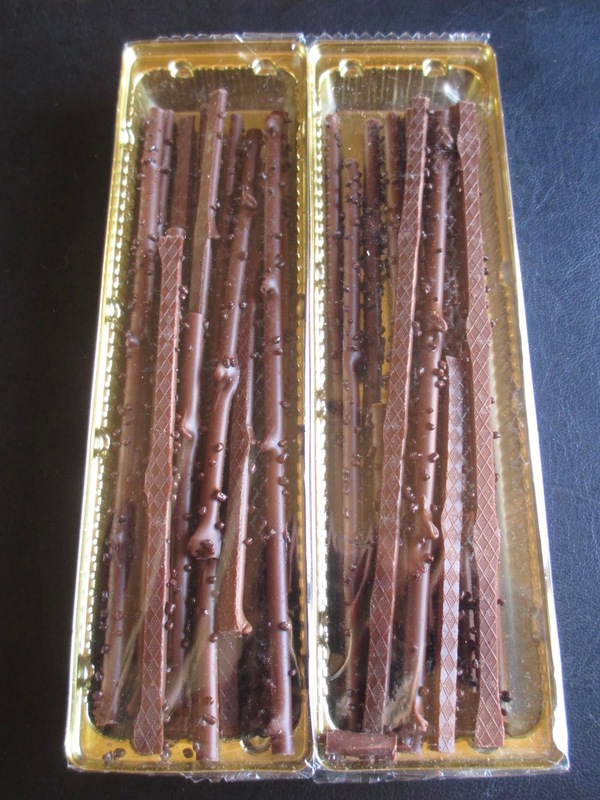 If they were designed specifically for Christmas, I suppose chocolate twigs might go along with a yule log cake. Christmas or non, I had to choose these chocolates: although I usually try and avoid chocolate labeled as Belgian (on the belief that it is generally cheap chocolate marketed to Americans who have never been, nor will ever go, to Belgium and will never taste chocolate there), I do love trees. So I was all for a chocolate and tree combination. 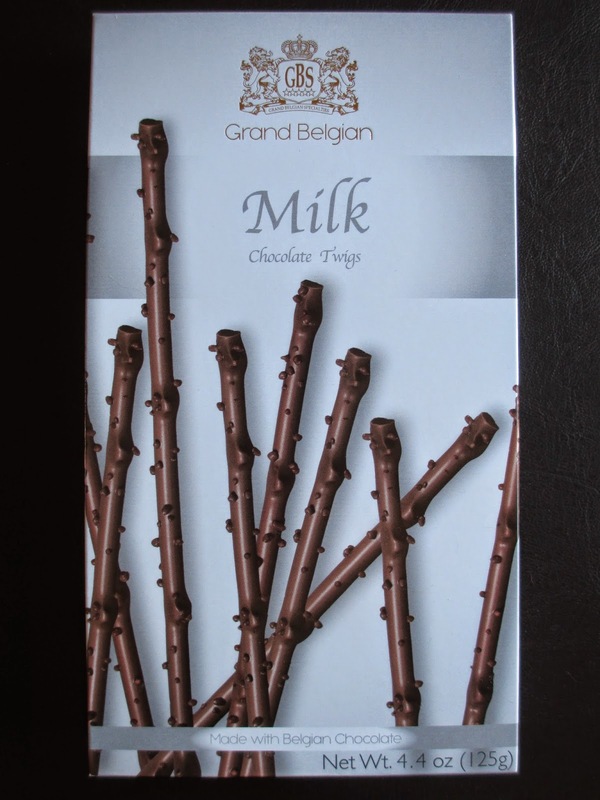 The twigs come in a box the size of a small box, which would suggest a large quantity of chocolate. However, the total is only 125 grams; a large chocolate bar is about 100 grams. So it can be either a personal chocolate box or something to share, a gift or a stocking stuffer or dessert. The twigs are around six inches in length, very thin, and come nestled in two gold trays covered in clear wrap. Not completely pretty, but completely average for packaged, mass-produced chocolate. And despite all my misgivings about the gold trays and the cheap chocolate, these twigs really did satisfy my tree interest. You can't, perhaps, tell so much from my pictures (which are in the aforementioned gold trays), but the chocolate twigs are quite pretty. They're smooth and rounded on one side, with a flat, lightly patterned end, which makes me wonder if they were somehow piped out onto a flat surface instead of being molded. At intervals, there are little knobs in the chocolate wood and tiny dots, which look like they would be hard sprinkles, are simply more chocolate. I would love to see how someone creative would incorporate these twigs into a dessert display. I was not, however, wrong about the chocolate. This chocolate is fine. It's milk chocolate. It's sweet and a little nutty and a little greasy. It's standard confectionery chocolate. Alright, but nothing memorable and nothing for chocolate snobs. In a chocolate bar, I wouldn't be interested in eating more than a square or two. But in this form, in this form I am happy to eat it all and not share. It's the texture and the shape. Texture and shape mean so much for chocolate; this is why I might occasionally eat a Hershey's kiss but never a Hershey's bar anymore. The delicate thinness of the twigs somehow tantalizes the palate. My favorite way to eat them is to bite off half of a twig and softly break it into pieces in my mouth before chewing it away to a finish. Chocolate tasters make so much of a chocolate snap, but it isn't always that you can snap (not bite) a chocolate in your mouth. 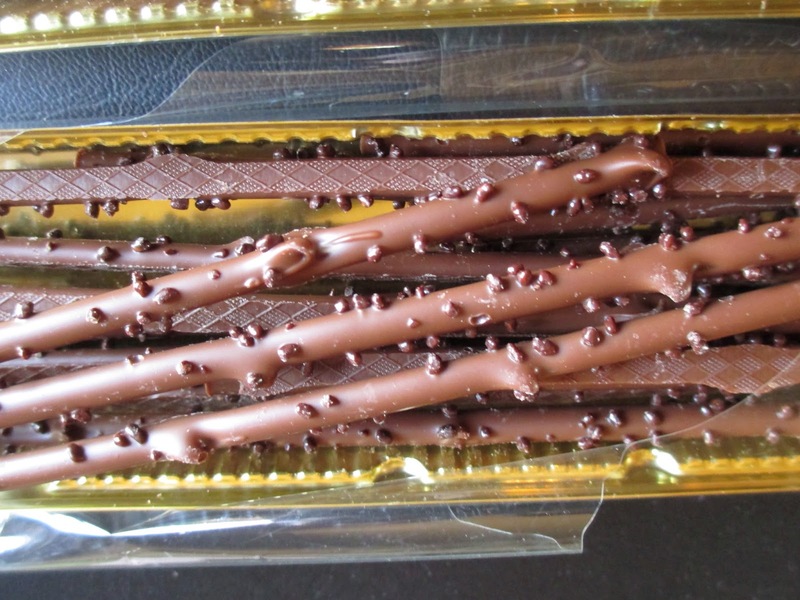 This stick shape makes these chocolates addicting like pretzel sticks even without the salt and the crunchiness. Even without liking the chocolate much, I do like this product. Sometimes music just takes a while to absorb. It can take time to listen to new music multiple times and learn the lyrics and ponder everything it's saying. Then when Flyleaf's latest album came out last year, there was also the new singer to get used to. That's the first time a band I've listened to has changed singers. While I was never sure what I thought of Lacey's voice exactly, I did know that I liked the way she sang, which might be the same thing, anyway; she just has such a specific way of singing with her heart in her throat that really became synonymous with Flyleaf. Kristen sings differently and while I appreciate that she doesn't try to just imitate Lacey (that would never work, anyway, since it would be false or hollow), her voice did take some getting used to. The EP that came out before the album helped me become familiar with her voice, but then I had to get used to the new sound all over again with the album. For a moment, everything felt different. I listened to the album and it was alright, but it didn't satisfy something that I wanted. So I waited and I listened more and I waited more. And then I recognized Flyleaf, the same as always, behind the one difference. The thing is, I'm not a musical person. So I don't think in terms of bass solos or drum beats . . . but I do really enjoy the sound that Sameer, Jared, Pat, and James put together. And that sound remains the same even with a new singer; that specific sound that is edgy and atmospheric all at once. Like the start to "Head Under Water." Don't even ask me to try describing it, but it's wonderful. And then once the music drew me back in, I was able to go back to Kristen's voice. She has a powerful voice to be able to match the music, gliding swiftly or slowly, sharply or softly. I accept her now. I admit that I was a little less than awed at some of the lyrics at first. Memento Mori remains my favorite Flyleaf album, but I suppose not every album needs to go so far and so deep into stories and the symbolic. Between the Stars is closer to the vein of New Horizons. I think the title speaks to that weightless feeling of exploring what different moments in life mean, that atmospheric sound to the music; the stars also can stand for all of the people that you come across and meet and live with. This album is about taking floods and turning them into life, about sprouting growth and goodness from what could keep you down instead. "Set Me on Fire," "Sober Serenade," "Head Under Water," and "Magnetic" are some of my favorites. "Thread" and "Marionette" are also good. I have mixed feelings about "City Kids" and "Blue Roses." Given that Flyleaf is one of my favorite bands (Memento Mori is one of my favorite albums ever), it is nice to continue to get new music, new things to add to the mix. There's getting to be rather a variety now. Even in the realms of fantasy and sic-fi, there are only so many people like him. Some characters have some of his traits, but few have all. He is the wanderer, the the great one who is doomed to walk forever across the world without stopping for himself. He brings chaos in his wake, but he also rescues so many, saves so many, and keeps even greater negative forces at bay. He walks alone, in the end; yet he also makes friends along the way, friends who begin to understand who he is even if they can only share in part of his adventures. He can fit himself into any situation in any place: he can be regal or rustic, show off his intelligence or feign dim-wittedness, whatever is necessary. He usually thinks he is always right because he usually is right--but because he is so often right and so often great, when he falls he falls all the harder. Yet he can fall right into death and still return to the land of the living. He is the Grey Pilgrim, Mithrandir; he is Gandalf. He is the Doctor. Think about it. There are other characters who are outsiders, who pass by just long enough to save a few lives or the town or whatever it may be. There are characters who can be both serious and jolly. But what other characters share so many traits as Gandalf and the Doctor do? I have to keep pondering this: I really can't think of any more. It is true that Gandalf is not the only wizard in Middle-earth. But the blue wizards are hardly spoken of, Radagast only makes a brief appearance (ha, ha, ha, Sylvester McCoy, who is the wizard doctor), and even Saruman becomes separate from Gandalf when he turns to evil. Saruman can also be like the Master. The Doctor wasn't always alone--and then, later, he finds that he is alone except for the Master, who always has so many evil plans. But perhaps the Doctor has more sentiment than Gandalf does. Gandalf's interest in hobbits is not so unlike the Doctor's interest in his companions, yet the Doctor always feels he has a connection to the Master just because they are all that's left of the Time Lords. Gandalf has no such loyalty to Saruman; he is only interested in keeping Middle-earth safe. Wow, Doctor Who has really reawakened my character comparisons. But I think it says something that the comparisons are often of very valuable or well-crafted stories. If a story has powerful characters, that story will stick around, as both Doctor Who and The Lord of the Rings have done. These two characters have remained so memorable because they give us hope, not just the hope that the world can be made better but also the hope of living a simple day and enjoying it just for being itself. Click for my initial thoughts on An Unexpected Journey and The Desolation of Smaug. When we walked out of the theatre, I was asked what I thought of The Hobbit: The Battle of Five Armies. I laughed and said that I didn't even know what to think but I had enjoyed it. And, you know what, I think that pretty much sums up my thoughts on this last movie and on The Hobbit movies as a whole. It's strange to analyze because you have to keep coming back to what these movies should be, what they set out to be, and what fans wanted them to be. If we had been given one movie that was a very straight adaptation of the book, I think it would have satisfied hardly anyone: while I'm not calling the book flat, there are many things about it that are flat. So these movies have added in awareness of The Lord of the Rings (which, of course, was something that Tolkien also wanted to do) and also awareness of people's love of Middle-earth. Sometimes good things don't have to end instantly; we can let them linger a little. So if there are going to be three movies, why not? 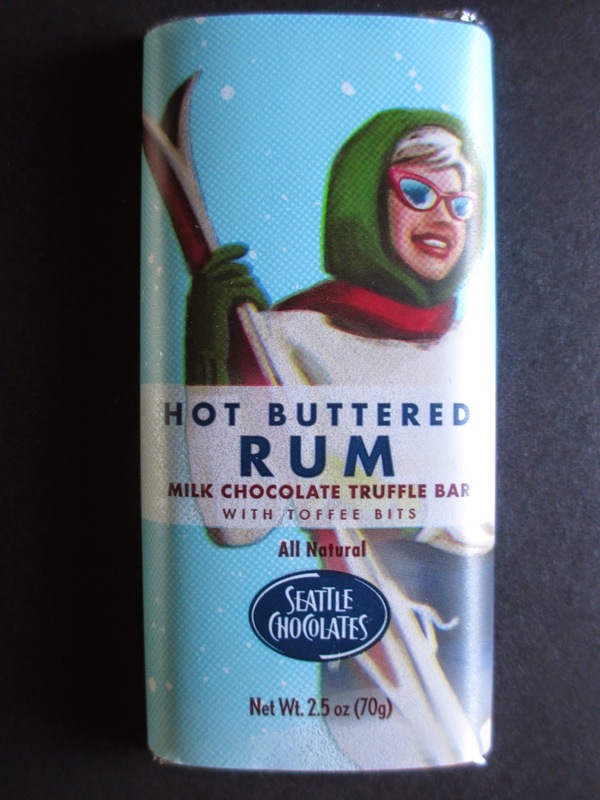 I knew I recognized the name of Seattle Chocolates, but it took me a moment to remember from where precisely. A year or so ago, they made the Dead Sea Salt bar for Halloween--you can read my review of that one here. This time, I have a Christmas version of the same 70 gram milk chocolate truffle bar base. The flavor is Hot Buttered Rum, which I thought sounded rather unique. My next question was, what exactly does Hot Buttered Rum mean? This isn't an alcohol-filled chocolate; in fact, there is no alcohol in it at all. I've had rum, but never hot buttered rum (really, who has?). So what kind of flavor exactly are they going for? The fine print is a hint: "with toffee bits." Ah, so is this just a regular toffee chocolate under a cool-sounding, unique name? Fortunately, not really. There is a hint of an alcohol taste to the chocolate, despite there not being any alcohol in it. I suspect it's due to a high dosage of vanilla, which is itself practically alcohol, anyway. The toffee bits are on the big size, about the size of cacao nibs, and they're rather good. They have a very sweet, very caramel, and very vanilla flavor about them. Together with the vanilla-y chocolate, it does create a buttery flavor. Let's get one thing straight: I still consider this more of a candy bar than a chocolate bar, despite it being more than a dollar. The chocolate is okay but not great and there is nothing truffle-like about it. But candy is quite welcome during the holidays and the cold weather; I had this bar as a stocking stuffer, and it did quite well as such. It's small enough that it can disappear in a couple of sittings without sticking around for extra analyzation. Just something sweet to enjoy on a winter evening. I've had a lovely New Year's Eve. It snowed all morning and also into the early afternoon, so I spent the morning playing in the snow, building snowmen and the like. Then the evening was filled with eating peanut butter cookies and brownie pudding and drinking coffee and champagne and watching Downton Abbey and having many grand laughs. It's been very nice--now let me get on with my slightly late favorites list. Thanks to the presents and such that are on this list. 1) Sting Letter Opener - I happened to go to a certain Barnes & Noble around Phoenix that's closing--so many things that are never on sale were at half off. I'd been thinking I needed a nice letter opener, so even though I wouldn't really have considered this one otherwise, I figured it would do. It does make me feel fancy to use a letter opener, and Tolkien memorabilia is good, no? 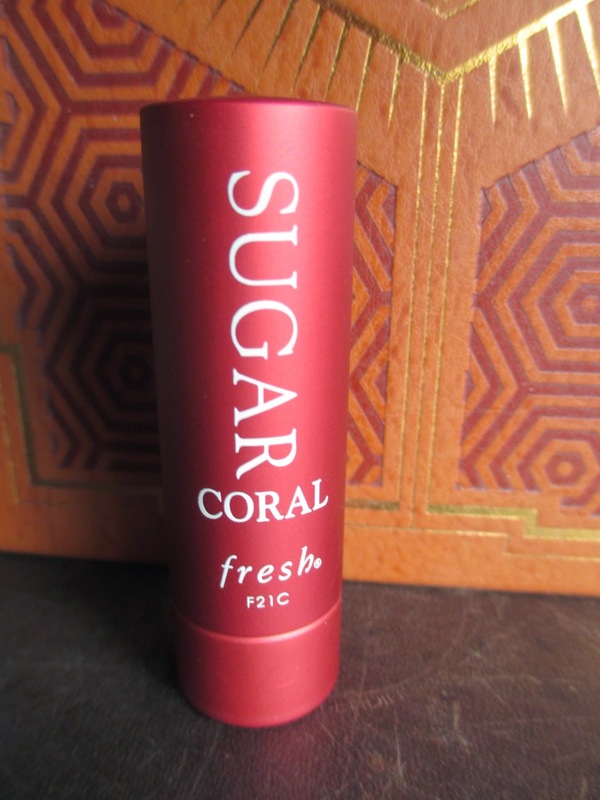 2) Fresh Sugar Lip Balm in Coral - This is my first full-sized Sugar lip balm, and it's really perfect because I was in need of a lip color with a hint of orange instead of just pink and red. It's only a hint and like most of the Fresh colors, it's more of a tint than a full on color splash. 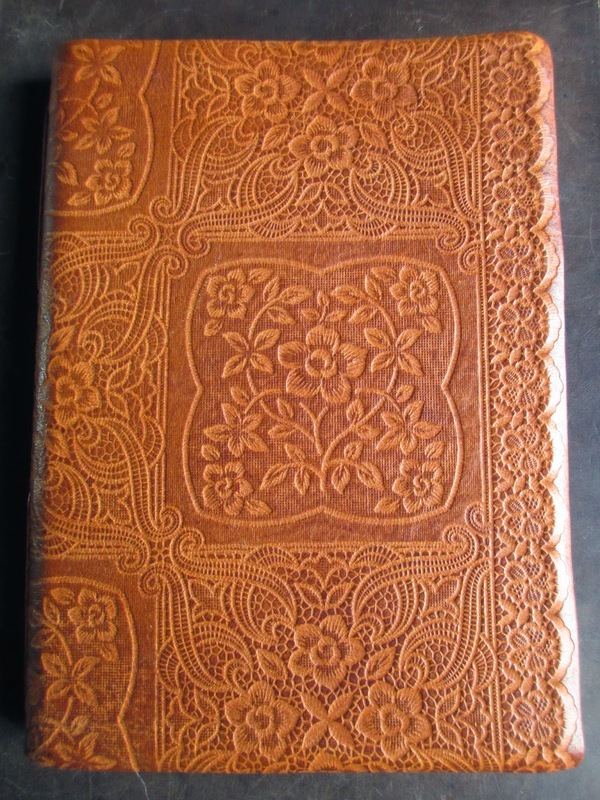 3) Leather Notebook - At the said Barnes & Noble, I also picked up this notebook. All the intricate flowers won me over, me with my weakness for notebooks. And the notebooks are never on sale. 4) Bite Beauty Matte Creme Lip Crayon in Sucre - This is also my first full-sized Bite Beauty product. I haven't had a chance to use it much, but it's a nice and pretty pink color and it has pretty good staying power. Bite products really are great (they're also made of food grade ingredients, so no worries about toxic makeup), even if I'm not too fond of the boring gray case. 5) The Art of Disney Postcards Set - I couldn't resist these, even though I'm pretty sure I'll never be able to bear sending any of them out as postcards. They have illustrations of Disney characters, stills from movies, that sort of thing. Some of them are traditional, and some are rarer. All are wonderful to look at. 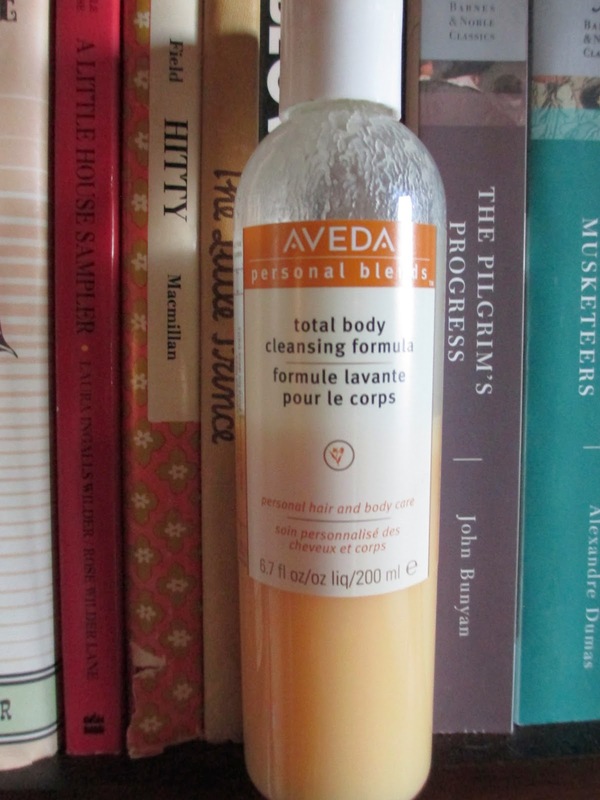 6) Aveda Shower Gel - If you ever buy anything at Aveda, you'll know that if you let them sign you up for their birthday list, you get a free product during the month of your birthday. In the past, I had chosen the perfume spray, which I wasn't overly fond of. This year I tried the shower gel, which is in fact quite a big bottle for a free product; I was impressed. Like the other items you can choose from, you get to pick out your favorite scent and they mix it into the product for you. Besides the size, I'm also impressed with this product of itself; I'll probably want to buy more of it. It's silky smooth to the touch, like a very soft shampoo. That makes it pleasant to use, and what's more, I find that it makes for a nice shaving gel. I'd really recommend it. 7) A Novel Journal in Jane Eyre - When I find myself at Costco, I do like to take a look at the book and movie section: you never know what you might find, especially during the holiday time. 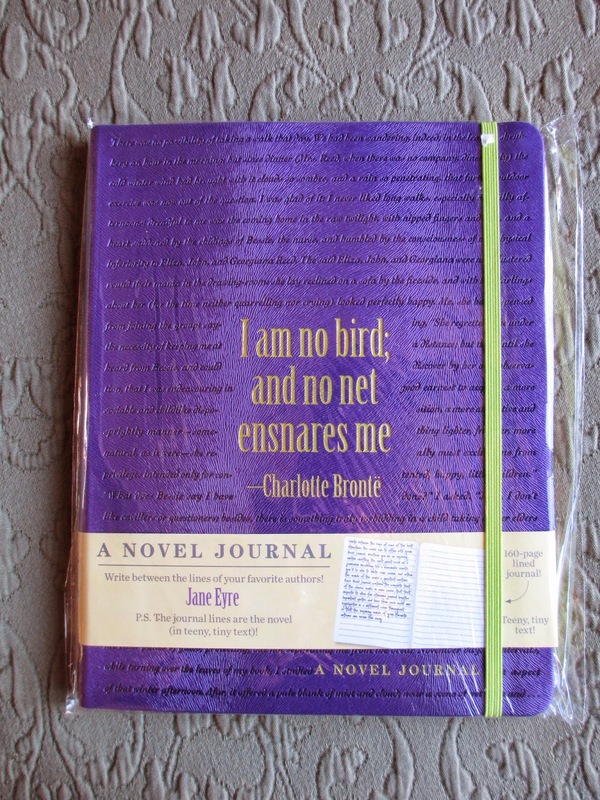 This journal is an interesting concept: the lines on the pages are the text of Jane Eyre in tiny print. There were a few other novels also available, though of course Jane was my pick. It's a novelty--yet one you can use. 8) Tarte Tres Chic Park Avenue Princess Contour Palette - I have my one blush from Tarte, but I didn't have a bronzer. This little golden palette has two golden shades and one pale pink. 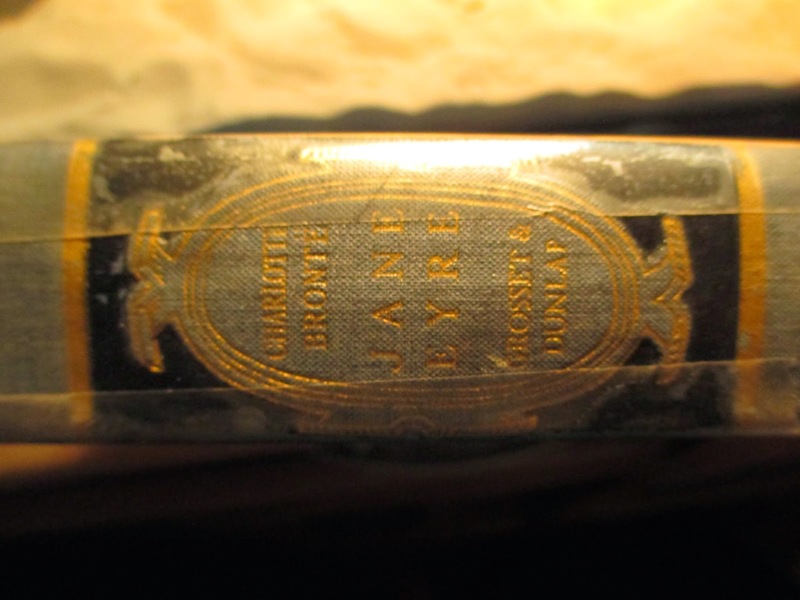 9) Vintage Copy of Jane Eyre - My latest copy of this book was found at an antique store, but it came from a school library around the area I live in. So it's kind of like a local bit of history. 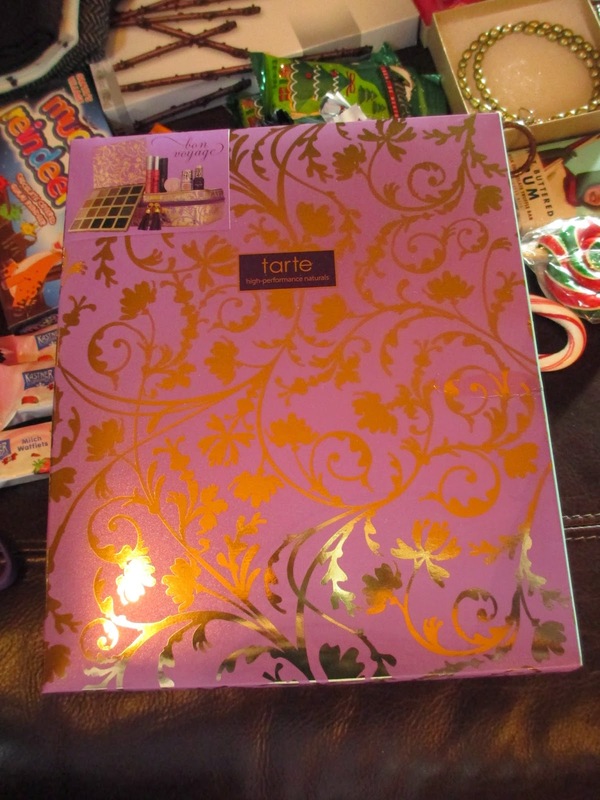 10) Tarte Bon Voyage Collector's Set and Travel Bag - I had my eye on this year's holiday set from Tarte. It came in such a pretty travel bag, and the eyeshadow palette is a varied collection of usable, neutral shades. The two full-sized lip colors and the travel sized maracuja oil are also nice to have. 11) Wooden Pigeon - My two cast iron pigeons have gained a friend, who sits with them on top of my bookcase. He's in more traditional colors, blue and black. He is pretty. 12) Tarte Kiss and Belle Lipsurgence Lip Set - This year's lip set from Tarte has six lip tints (you know, the crayon kind) and two glosses, all mini. A couple of them are bright, and the rest are lighter, and I do believe I like all of them--except for the matte orangey shade, which I've already given away. The caps are very lovely. 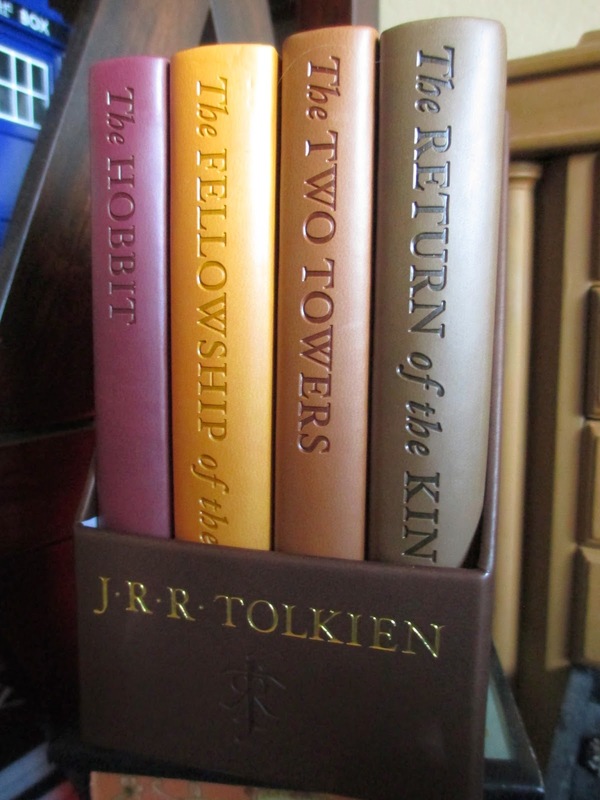 13) The Lord of the Rings Leatherette Book Set - These really are travel-sized. I have a weakness for small things; I think they're cute. I just like to gaze upon these--and also to know that they're so easy to slip into a purse or suitcase when you want something to read on the go. 14) Seventh Muse Perfume Oil in Rose - A couple of years ago, I got the Violet version of this perfume oil. Now that I claim rose as my favorite scent, I'm happy to add this bottle to my perfume collection. As modern as mixed fragrances are, I do enjoy single, floral scents very much, as well--sometimes more. 15) Dinosaurs: The Grand Tour - This book is somewhat like an encyclopedia of different dinosaurs, going by which era they lived in. It's full of information and makes it easy to look up a particular dinosaur. There are also some fun (and adorable) pictures. It's quite a new book, too, published just this fall, so there's some pretty current information in here. I've been enjoying flipping through it. 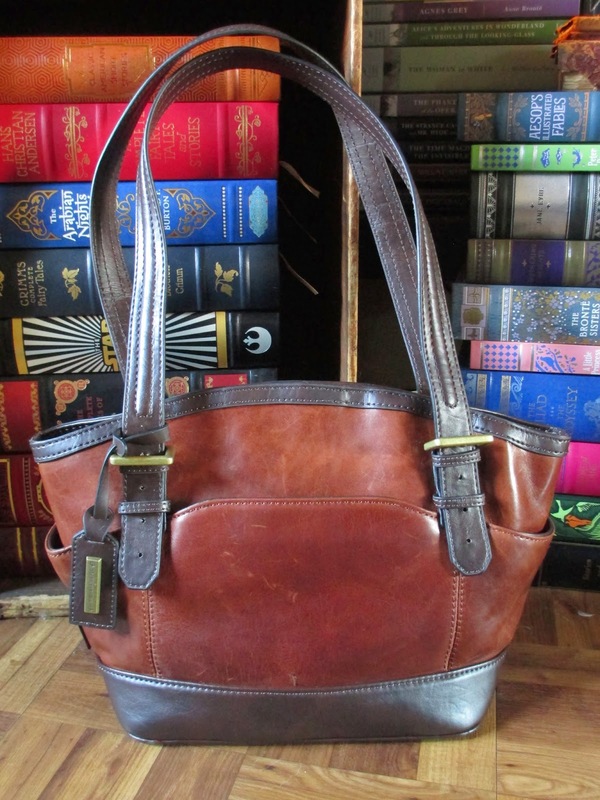 16) Tignanello Classic Leather Purse - I had never heard of this brand and I still haven't looked it up: whatever the brand, this purse seemed exactly what I was looking for (I wasn't looking for a new purse, but I thought I would get a brown one if I saw the right one). It's exactly the right size for my height: not so big as to overpower me, but big enough that I can put things in it. The straps aren't over the shoulder, yet they're long enough that I can put them on one shoulder even when I'm wearing a thick jacket. The design is plain enough that nothing distracts me from the rich brown of the leather. I'm not overly fond of the lining, but when everything else is just right, I can hardly complain about that. 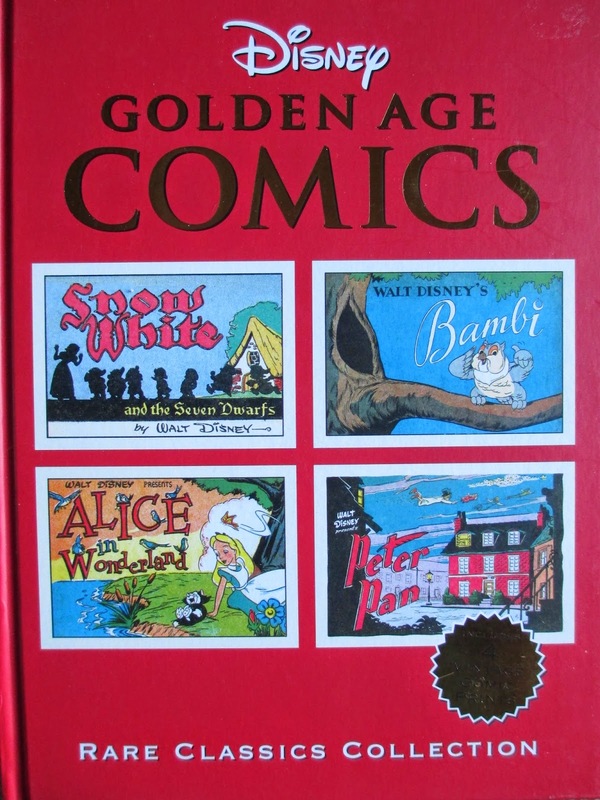 17) Disney Golden Age Comics - Here's another book I'll have to spend some time with. It has the comics versions of classic Disney films and accompanying stories. So besides all the images, there are also some scenes that the movies don't show. 18) Vintage Cameo - I'm not quite sure about the age on this cameo, but either way it is delicate and lovely in its crafting. It has three full-sized figures. Perfect addition to my collection. 19) Vintage Ink Wells - These are pretty things, grand and dainty all at once. The solid white bases have intricate golden tops with the last remnants of green and red paint. 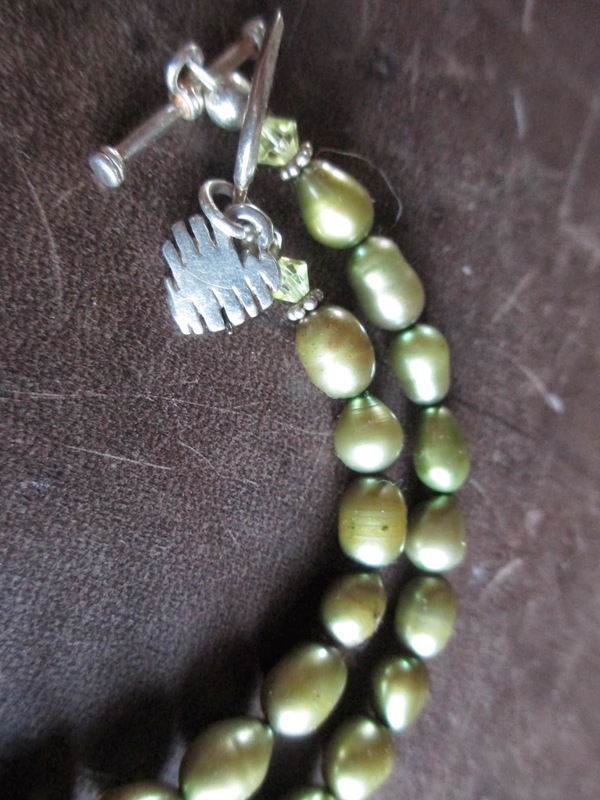 20) Green Pearl Necklace - I was having trouble getting a decent picture of this pearl strand. They're not really an olive green; it's something neutral like that, but livelier. I like the combination of the classiness of pearls with the joyfulness of green. 21) Green Macaroon Case - I have one of these in light pink; I've been wanting the green one also, but the store I got it at has been out. Now I am content. 22) Tocca Travel Fragrance Spray in Florence - Since Florence is my favorite Tocca scent and it was among the perfumes to come out in this enchanting travel spray bottle, well, here it is in my hands. The box it comes in is also beautiful; it opens like a little green book. 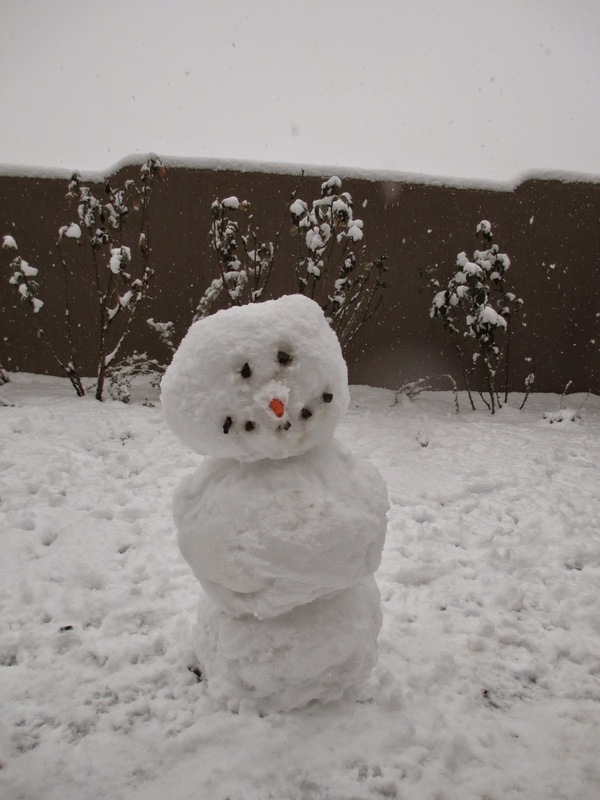 23) Snow - And in case you didn't believe me, here is the first (and smaller) snowman I built this morning. The snow does look rather light, but I assure you it came down steadily for hours and there were a few inches to its depth. That's the most I've seen in this area, and all I was expecting for today was rain. It really was quite exciting to wake up to. A lovely white New Year's Eve. Now I must finally get to bed: it's nearly three o'clock.